Robometricschool. - When you read the title of this article, we think you will not foreign again with this statement. As we know that many technology developing in this time include in robotic technology. And then there are many field that will be done by robot now. We can take one example, in many time ago we still need human to help our work at home to sweep and clean all our home, but with robot the human can be removed effectively. One of the country that develop robot hardly this time is Japan. There are many robot kinds that produces from Japan. And it is make this country called as the number one of the robotic technology development in this year. There are many reason or something that inspiration Japan to develop robot in this time, like from comic, movie, and others. 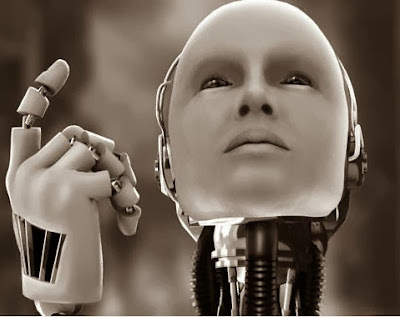 All condition above show us that there are many field of human profession that take over by robot. It is also happen in industrial that it is not the new phenomenon in this time. With robotic artificial intelligence (AI) robot also will take over many human profession like in office, at home, garden, etc. Shall you ready replaced by robot now? According Andrew Anderson, a robot with artificial intelligence, however, in less than five years is likely there will be no office workers because of the people in this region was completely replaced by intelligent robots. Looks quite threatening and the introduction of robots in other professional fields. With Artificial Intelligence that robot belong, it will make robot automatically solving administrative tasks and even capable of making their own decisions. Ability to learn intelligent robots in the future will minimize the need for clerical workers, as the current intelligent robots can read and understand the meaning of the document, while exploring the patterns of words and phrases in context. According the scientist said that AI believes that by 2025 robots will learn to process information, correct the problem and make different decisions, even if necessary, reprogram him. The company is vying to design robots that can work professionally in sales, healthcare, education, finance, IT, management and law. In this condition maybe you must prepare your ability in work in your field profession, not until you will be replaced by Robot that very modern this time.